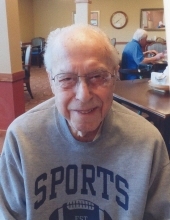 Earl R. Luth, age 94, formerly of Glenbeulah, passed away late Friday evening (Feb. 8, 2019) at Cedar Landing in Elkhart Lake. He was born on October 2, 1924 in the Town of Greenbush, WI, a son of the late Henry and Ella (Kessel) Luth. He graduated from Glenbeulah High School in 1942. Earl served with the U.S. Army from 1950-1952 serving in Japan and Korea. On August 21, 1954 he married Xaveria Zolp at St. John the Baptist Catholic Church in Plymouth. After their marriage the couple resided in the Town of Greenbush where Earl was a dairy farmer. Earl was extremely proud to receive the Century Ownership Award from the State of Wisconsin for farming the Luth farm for 100 years. He was a former member of St. Fridolin’s Catholic Church where he served on the church council and as treasurer for 30 years and a current member of St. Thomas Aquinas Catholic Church. He also served as the Town Chairman on the Greenbush Town Board for 30 years and also served as the secretary for the Greenbush Volunteer Fire Department for many years. Earl enjoyed hunting and fishing. Survivors include his loving wife: Xaveria “Xcee” of Elkhart Lake; Children: Jeffrey Luth (Fiancée: Connie Wolf) of Chilton, Richard (Nona) Luth Watkinsville, GA, and also survived by other relatives and friends. He was preceded in death by one daughter; Patti and Two sisters; Dorinda Dorn and Luella Schulz. Mass of Christian burial will be held on Wednesday (February 13, 2019) at St. Thomas Aquinas Catholic Church in Elkhart Lake at 4:00 P.M. Father Philip Riefenberg, pastor of the Church will officiate. Entombment will at Gardens of Peace in the Town of Sheboygan. Friends may call at the CHURCH on Wednesday (Feb. 13) from 2:00 P.M. until the time of services. Military rites will be conducted by the VFW World Cheese Center #5612 of Plymouth following the Mass at church. In lieu of flowers, a memorial fund is being established in Earl’s name. To send flowers or a remembrance gift to the family of Earl R. Luth, please visit our Tribute Store. "Email Address" would like to share the life celebration of Earl R. Luth. Click on the "link" to go to share a favorite memory or leave a condolence message for the family.